This game closes Feb. 18. Send in nonwinning tickets by Monday, March 25, 2019 to be entered in the final second chance drawing. Instant prizes from the game can be claimed until June 22, 2019. The Louisiana Lottery is going back to the basics for its 10th year launching a Saints-branded scratch-off game, SAINTS! Tickets feature the Saints fleur de lis on white, black and gold backgrounds with metallic ink. In addition to the specialty ink, this year’s ticket will also include high definition images and symbols underneath the scratch-off material to provide a more engaging play experience. In addition, nonwinning tickets can be entered into a series of second-chance drawings to win unique game-day prize experiences or official autographed Saints merchandise. Three second-chance drawings will feature a total of 38 winners. The type of experience and merchandise given away will depend on the entry period. The National Football League, its member professional football clubs, NFL Ventures, Inc., NFL Ventures, L.P., NFL Properties LLC, NFL Enterprises LLC and each of their respective subsidiaries, affiliates, shareholders, officers, directors, agents, representatives and employees (collectively, the NFL Entities) will have no liability or responsibility for any claim arising in connection with participation in this lottery or the prize awarded. The NFL Entities have not offered or sponsored this lottery in any way. 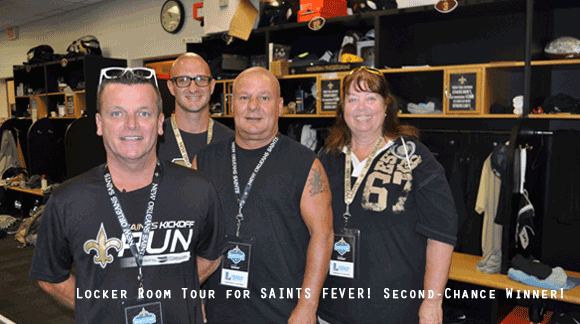 Participants in the first second-chance drawing will be eligible to win one of three 2018 Saints Suite Access Prize Packages to the Nov. 18 game against Philadelphia, including four tickets to the exclusive Louisiana Lottery 300 level suite and a visit by a former Saints player. One lucky name will also be drawn then to be the winner of the 2018 Saints Tunnel Team Prize Package for the winner and three friends, to the Nov. 18 game, including four Plaza Club sideline tickets, four entertainment passes allowing the winners crew to stay on the field even longer, one parking pass, one-night hotel accommodations (two rooms) and $500 spending cash. The entry deadline is Oct. 8, 2018. Entries received from Oct. 9 through Nov. 19, 2018 will be eligible to win one of five 2018 Saints Suite Access Prize Packages to the Dec. 30 game versus Carolina, including four tickets to the Louisiana Lottery 400 level suite and a visit from a Saints alumni. 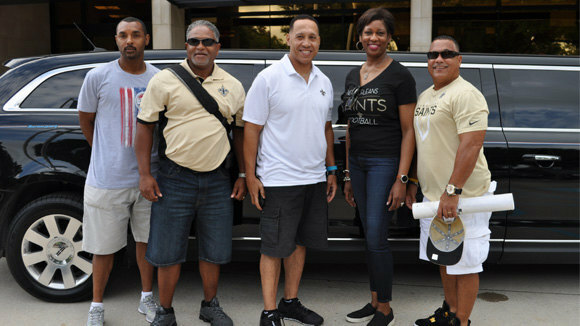 Also during the second drawing, one winner will be selected to receive a 2018 Saints Deluxe Prize Package, including four Plaza Club Sideline tickets, four pregame field passes to the Dec. 30 game, one-night hotel accommodations (two rooms), limo transportation to and from the game, accompanied by a former Saints player, four authentic Saints jerseys and $500 spending cash. 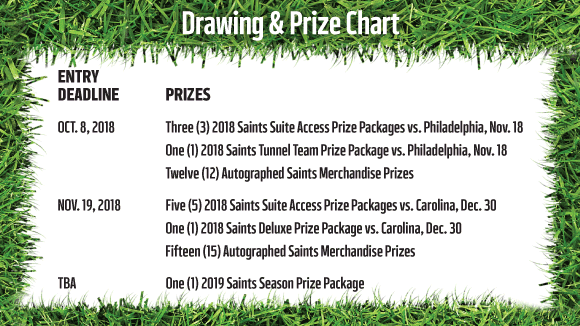 Entries received from Nov. 20 until March 25will be eligible to win one Saints 2019 Season Prize Package, including four Plaza Sideline tickets for the 2019 football season, four pregame field passes for every home game, a 2019 parking pass and a VIP tour of the Saints practice facility. 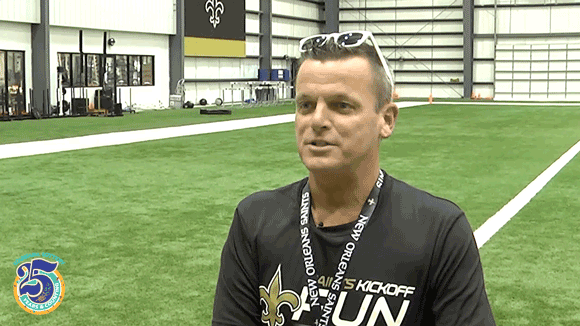 The winner and three guests will receive round-trip limo service to the facility in Metairie (or overnight accommodations if the distance exceeds 75 miles) where they will also view a team practice and have lunch in the team cafeteria. During the first and second drawings, additional entries will be drawn to receive one of the following prizes: an official autographed Saints jersey, football or helmet. Twelve winners will be randomly chosen during the first drawing and 15 during the second. 1. 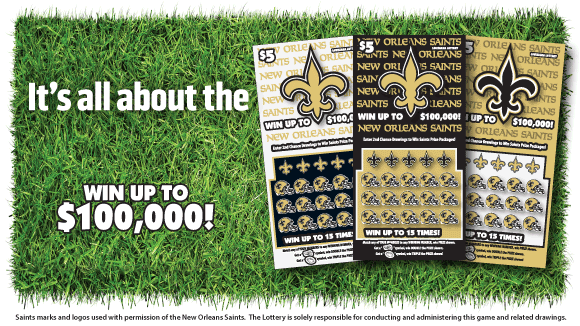 To enter the second-chance drawings, players should complete the information on the back of nonwinning $5 SAINTS scratch-off tickets. 2. Mail one ticket per envelope (no larger than 4.5" by 9.5") to the drawing address printed on the back of the ticket. 3. Players can enter as many times as they wish, but each entry should be mailed in a separate envelope. By entering the second-chance drawing, you grant the Louisiana Lottery permission to use your name, images and city of residence in its publicity efforts should your entry be selected as a prize winner! Join the Louisiana Lottery outside the Mercedes-Benz Superdome before select Saints home games for exclusive tailgate promotions! 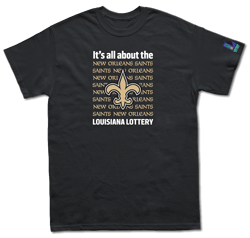 When fans purchase three (3) SAINTS scratch-offs ($15 worth) onsite at our promotional trailer, they will receive a Louisiana Lottery New Orleans Saints T-shirt. With a $20 purchase of SAINTSscratch-offs, they will ALSO be entered into a drawing for an official autographed Saints jersey. The Lottery's promotional trailer will be located on the second level of the Mercedes-Benz Superdome across from Benson Tower. Come tailgate with us! Nov. 4 vs. Los Angeles Noon to 3:25 p.m. It's All About the SAINTS!